Pentax’s 12-megapixel X70 boasts an impressively wide and exceptionally long 26mm-to-624mm-equivalent lens, which can be kicked up to a downright-ridiculous 3,900mm by using the digital Intelligent Zoom feature. It zips from wide angle to telephoto with surprising speed, considering its range. 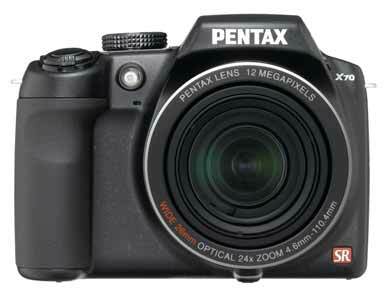 By refraining from adding any extraneous buttons, Pentax has also made the X70 very simple to use. The thumb dial at the top is well placed and makes shifting between the ten camera modes (including advanced options such as shutter priority and aperture priority in addition to program and manual modes) a quick and easy process without the need to dive into on-screen menus. For those who simply want to point and shoot, the dial also has a fully auto mode and a scene mode that offers access to the usual suspects, from the handy “night scene” and “kids” to more-obscure options like “fireworks” and “museum”. With the X70’s manual and semimanual modes, you can easily adjust shutter speeds and aperture settings. The X70 has a 2.7-inch LCD. Another of the X70’s surprises was its ability to shoot 11 frames per second when set to continuous mode. True, the images drop from 12 to 5 megapixels in size, but that’s pretty standard in such operations, and 11 fps is faster than what nearly every other camera in its class provides (the exceptions being a few jaw-droppingly high-speed Casio models, such as the EX-FH20, the EX-FC100, and the EX-FS10). So, what’s the rub? For starters, battery life is disappointing. In our lab’s battery tests, the camera shot 220 photos on one charge, enough for a score of Good, but still short of the 300-plus shots we’ve come to expect. In the field, when using the zoom and flash, that translated to less than 100 shots before the battery indicator started dropping bars (and when I start to panic). The battery is a rechargeable lithium ion one, too, so keeping a fresh pack of AAs with you won’t fix the problem. I found image quality less than impressive, especially when shooting at the telephoto end of the spectrum, but the X70 did score about average in our lab’s jury results for image quality. Image noise became an issue when zoomed any tighter than 6X, and photos taken in the “Intelligent Zoom” range were so noisy they were basically useless. That said, many megazooms have similar issues. Shutter lag, focus lock, and startup time were all a tad irksome, too. The camera focused well at wider angles, but when I zoomed in, it became painfully sluggish. Startup to snap time seemed slow, and the camera also lagged enough between photos that I found myself missing the playground shots. Last on my list of complaints: The flash does not pop up automatically (you have to hit a second dedicated flash button beside the flash), and this threw me when I was trying to quickly shoot a photo under low light. What makes the Pentax X70 stand out? Its compact size, light weight, 11 fps rapid-fire mode, and terrific usability. The X70 is smaller and lighter than nearly every other camera in its class; depending on your hand size, that might be either good or bad. Although its diminutive size gives it a slightly fragile feel, it’s nice to be able to tuck the camera into a backpack or throw it over a shoulder and hardly know it’s there.